Once you have installed WordPress, you’ll be ready to start adding new posts, editing old ones and generally running your blog and… well… blogging. But at this point there is still a lot left to do and you can’t exactly rest on your laurels just yet! Apart from anything else, your blog will currently be very plain and simple and will likely look just like every other blog on the block. There’s nothing unique to make it yours and in short, it needs a theme! The word ‘theme’ is what is used in WordPress parlance to describe the look and feel of your blog, which can be changed very easily by simply installing a set-up someone else has created for you. You can find free themes, paid themes and custom themes – and you can then customize these to your heart’s content. 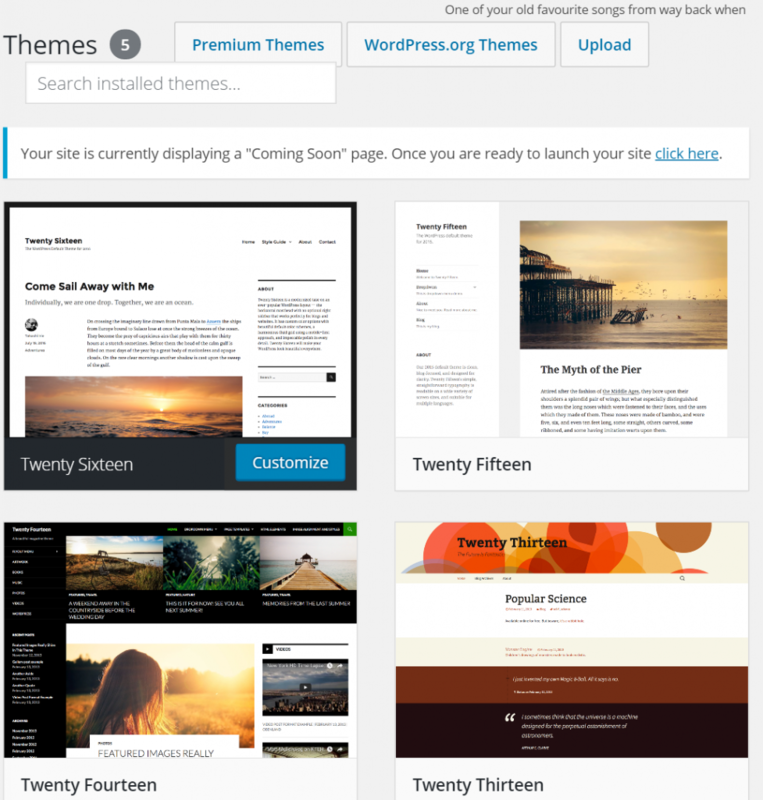 What’s better, is that themes are incredibly easy to find and install – just like pretty much everything when it comes to WordPress! Step one is to find your theme. There are a lot to choose from and you might struggle to know what makes a ‘good theme’ but don’t worry, we got you covered. Check out this post to find out how to choose the best theme for your site. Now, to install a theme the standard way, just head over to Appearance and then click ‘Themes’. 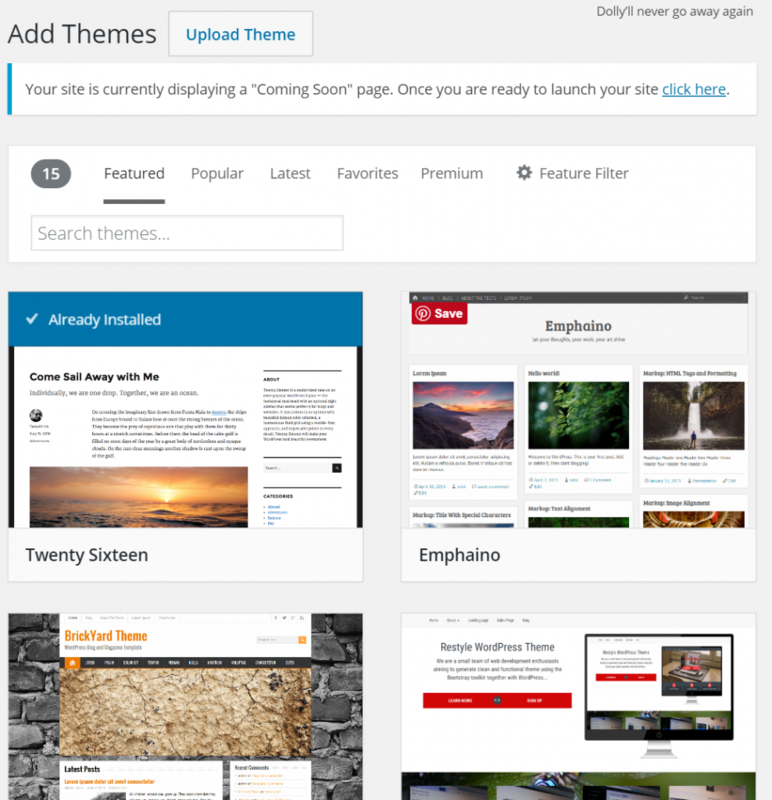 You’ll now be taken to WordPress’ very own theme store and here you’ll be able to choose from a wide selection of different themes. To start with though, you’ll just be shown the themes you already have installed and the one you have chosen. This will likely be either Twenty Sixteen (or Twenty Seventeen if you’re from the future) by default. Note that there is a difference between having a theme active and installed. Multiple themes can be installed on your site any anyone time, meaning the files are there and ready to go and any customizations you made are also still there. But only one theme can be active at a time and this will be what your site looks like at that given time. The next screen will now show you the ‘featured themes’ which are generally either newer ones, or ones that WordPress is currently recommending. 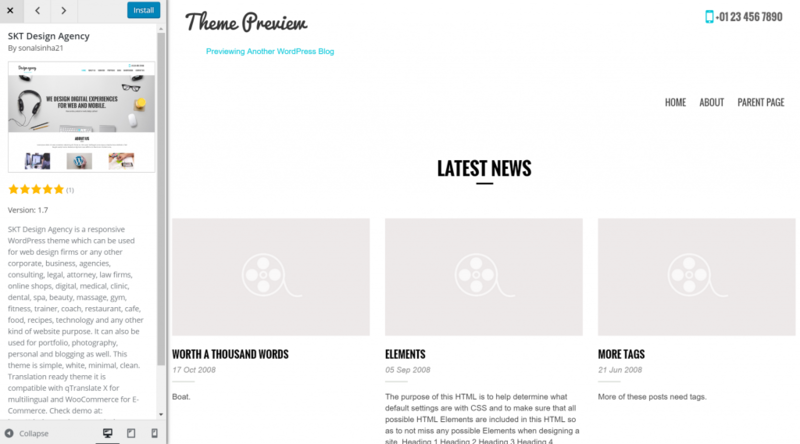 You can sift through these or you can use the ‘Search Themes…’ box to find more themes. You can also use the tabs along the top to look for themes that are popular, recently added etc. The Feature Filter is a particularly great option that will allow you to search for themes that have specific functions – for instance you might want to look for themes that have a responsive layout for mobile, or you might want to look for themes with two sidebars. When searching, it’s best to use terms that relate to the kind of thing you’re interested in. For instance, if your blog is about hardware, then try terms like ‘gadgets’ or ‘hardware’ to find themes that have been built with that in mind. Once you find the one you like, click it and you’ll be taken to a page that previews it. Let’s take a look at one called ‘SKT Design Agency’. (You can also hover the mouse over it and just click ‘Install’ right away). Don’t like it? That’s fine – click the cross button to close it and try something else. Don’t hit back because then you’ll just be taken back to the start! It’s a good idea while trying out these themes to also try changing the size of your browser window, this way you can see if the size adapts well. I’ve decided I want to use a theme called ‘CyberGames 2.1’. Let’s make this a gaming website! 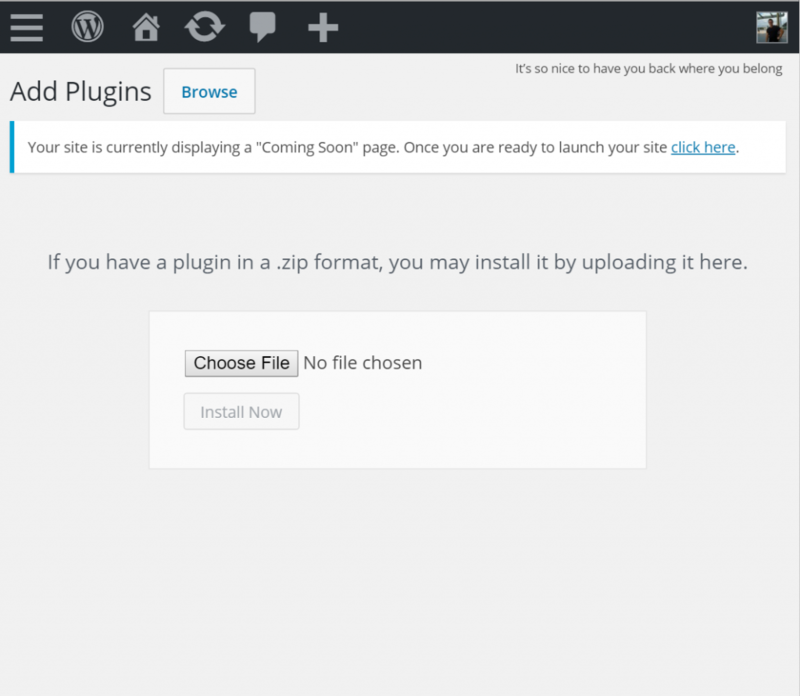 As with our previous post on installing plugins though, this isn’t done yet. While you’ve installed the theme, you haven’t actually yet activated it. You can still see the Live Preview (now populated with your own logo etc.) or you can ‘Activate’ to set it going. Once you hit that button, it’s now your main theme! If you want to change the way it looks, then you need to Appearance > Customize and then you’ll be able to change more or fewer features depending on the nature of your theme. You can then hit ‘Save and Publish’ when you’re ready to commit those changes. You’ll find there are a ton of themes here but you might decide that you don’t like any of the ones on offer. So what then? In that case, the best option is to go to Appearance > Premium Themes. This will allow you to find themes that are paid and those will generally be of a higher standard with more features. Alternatively, you can also go to the main Themes Page and then select ‘Upload’ from the menu along the top. When you click this, you’ll be taken to a page where you can upload your own themes in a Zip format. To use this, simply head to a site that offers WordPress themes and browse through them, just as though you were in the main theme store. One great example is Theme Forest but there are many more depending on your preferences.